If you have goals, you need the right framework and tools in place to meet them. Align is more than an OKR tracking system. 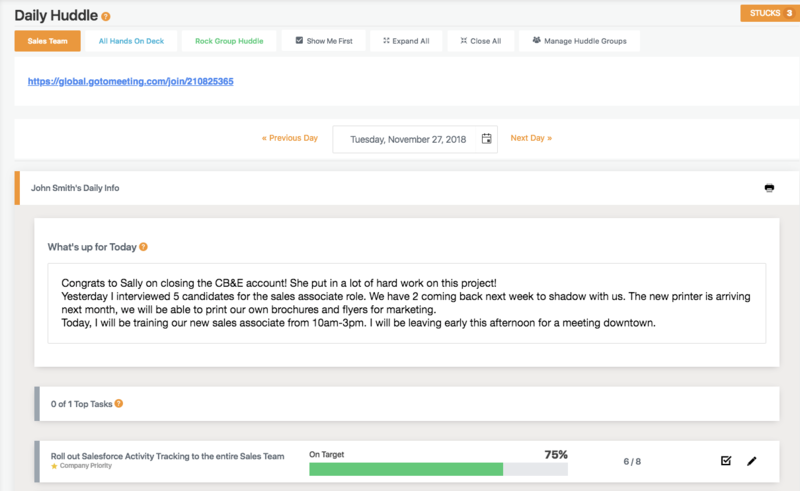 Businesses use Align to manage OKRs (Objectives and Key Results), boost employee engagement and build a culture of transparency. Our OKR tool is used by companies looking to disrupt the status quo in their business and meet their goals. 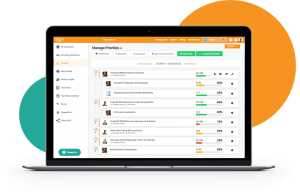 Our OKR software allows you to outline individual objectives, we call them priorities, that ladder up to organizational objectives and to measure performance against those. Read more about incorporating OKRs into your scaling business. Sign up for a free account for the first 21 days. Start using the full functionality of Align and invite unlimited team members. No credit card required. Tracking key results quantifies progress giving you data to evaluate what works and what didn’t. Teams use this to create a repeatable process for goal management. Team collaboration is crucial for OKR management. Align gives you a shared, transparent workspace to view progress – so everyone knows what’s most important and how they contribute to the company’s success. OKRs, or priorities, connect the company strategy with execution. It ensures each individual’s daily activities and tasks support the bigger picture. Alignment keeps teams engaged and on the right track to move the company forward. Use data to evaluate progress on a daily, weekly and monthly basis. It's not enough just to outline and measure, Huddles keep key information top of mind. See top-level company priorities, or objectives, and how individual priorities align. 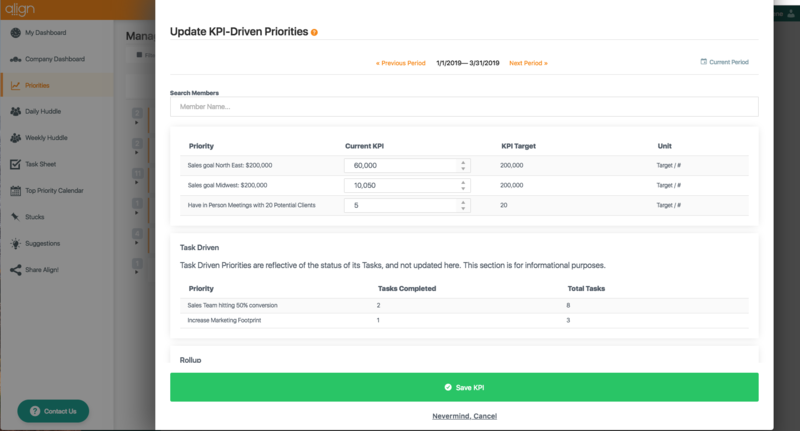 Transparent OKR dashboards reinforce the priorities that matter to the company, how they are measured and how each individual’s work is connected to the big picture goals. Use KPIs to measure the health of ongoing activities that contribute to the overarching priorities. KPIs measure the output of existing items and can be an indicator that a new priority, or objective, needs to be created. Teams need daily, weekly and monthly communication rhythms for effective OKR management. Huddles enable teams to report on status, opportunities or risks to their priorities. When teams communicate effectively, everyone is engaged and on the same page. Take a tour and ask questions. Join us for 30 minutes to see how Align can help you manage OKRs and more. Our team is here to help.